Gobassing.com is a comprehensive resource for bass fishing accommodation in Zimbabwe. We endeavour to provide detailed information on accommodation at bass fishing lakes, rivers and private waters throughout the country. Each lake, dam or river includes all the information that bass anglers require to make the most of their precious fishing time and of course a list of hand picked accommodation that we have found to be suited to the needs of bass anglers and their families. You can also search SafariNow.Com, the largest accommodation portal in Africa which offers almost 7000 establishments throughout the region. Check availability in realtime and make big savings by booking directly with the accommodation providers. Nottingham Adventures bass fishing camp is located on a huge dam on the Umzingwazi River, 45 minutes from Beit Bridge. More info . 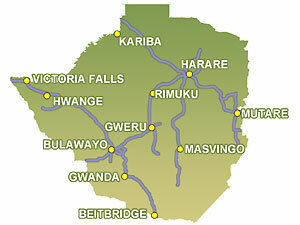 . .
Find Zimbabwe Accommodation through our online partner Booking.com More info . . .